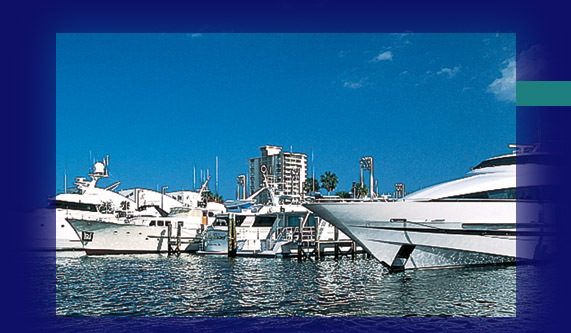 All of Fort Lauderdale is waiting dockside at Hall of Fame Marina. The famed Riverwalk with its first class restaurants, the stunning new beach promenade, the Broward Center for the Performing Arts and more will lure you by day and dazzle you at night. Hall of Fame Marina accommodates a wide variety of craft, with plenty of slips for year 'round tenants and visitors, making it a four-season destination port. Our gated docks provide 24-hour security, another comfort you'll appreciate whenever you visit. The International Swimming Hall of Fame (ISHOF) is Fort Lauderdale's tribute to those who have contributed to competitive swimming, diving, water polo, and synchronized swimming. The city has been a center for these sports since the 1920's, and today the ISHOF is the world's largest outdoor swimming complex. The Henning Library and Archive, a museum and art gallery, and a complement of pools for competition make this a fascinating place to visit.